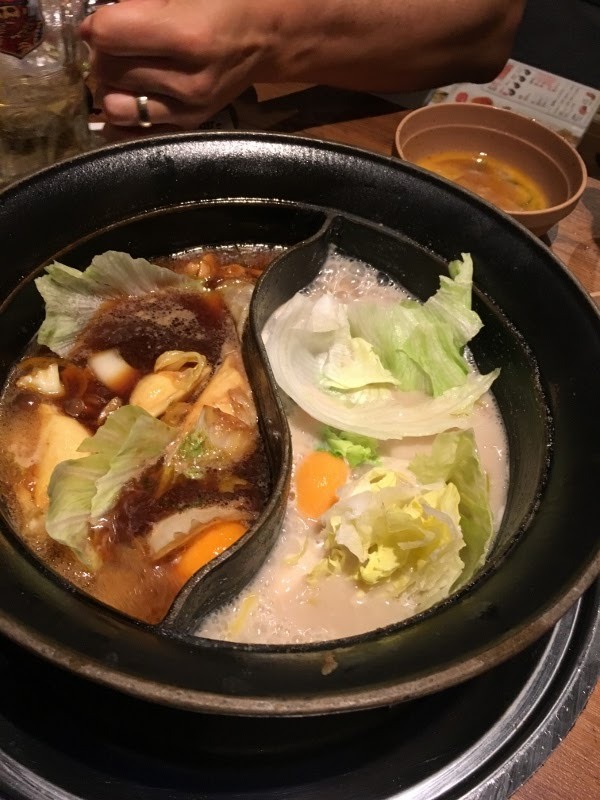 Sukiyaki on left. Lemon sauce on right. Eating in Japan is always an adventure. From slurping noodles to cooking your own food in a pot or on a griddle you can be sure some of the enjoyment is in the preparation and execution of consuming your meal. There are hundreds, maybe thousands, of little restaurants in Tokyo. They are squeezed into little nooks and crannies or on a second floor above a store. My son has an app that helps him decide which restaurant to choose. He doesn't rely on TripAdvisor as heavily as we do. We would decide on what type of food to eat and with a few clicks he'd find the best place to get it nearest our location. 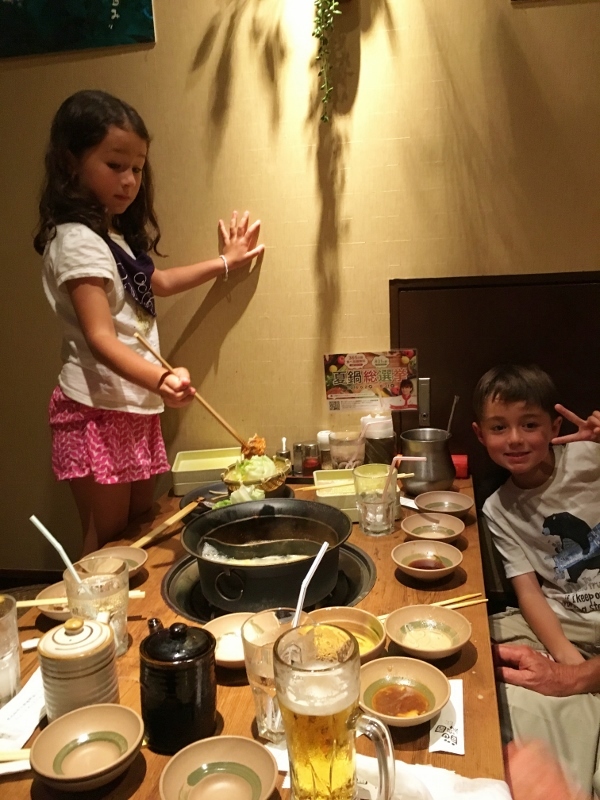 We enjoyed rice bowls with meats and sauces, yakitori, bowls of ramen noodles in broth with mushrooms and veggies, shabu shabu and sukiyaki, bento boxes, sushi, and Big Macs. Oh, that last one was with the grandkids only. After all they were born in the states and still like a taste of home. Rice bowls - usually served with a meat topping that can be beef, chicken or pork and has a light sauce over the rice and all in one bowl. Yakitori - think kabobs. It is chicken meat and/or chicken parts on a stick. I've seen everything from breast meat to chicken feet, liver and crispy skin. My granddaughter loves the crispy skin. It's really flavorful. Ramen - noodles usually served in a broth but it can be served cold on a plate with sauce for dipping. On a cold day I prefer the hot broth but this last time I tried the cold noodles with the dipping sauce and really enjoyed that as much or more. The hot broth often has vegetables and some meat in it and some dishes are served with an egg cracked on top of it. 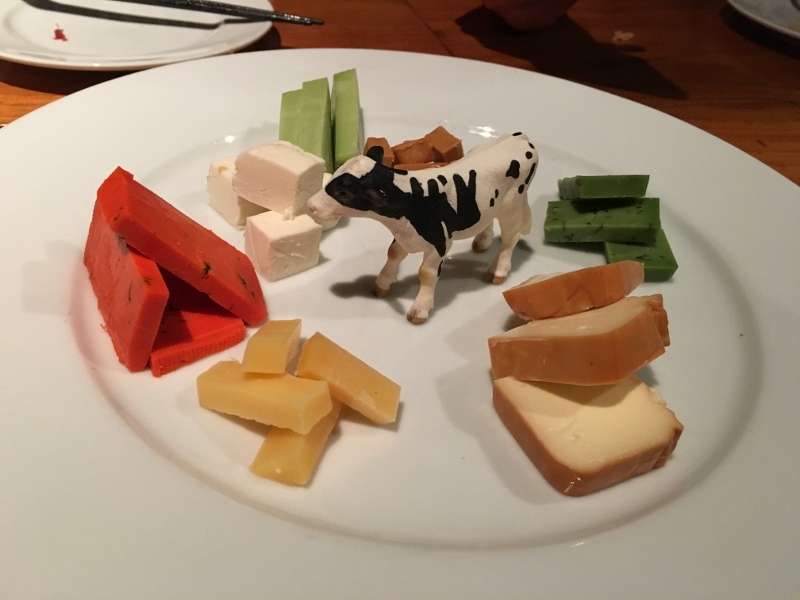 tomato, peach, caramel and kiwi cheese. Yum! 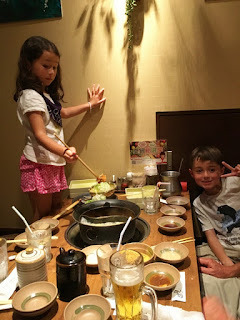 Shabu shabu - we had this at the request of my husband. He loves the hot pot cooking. The restaurant we chose had several sauces to cook in. Our daughter-in-law ordered three different ones for our two pots that were divided in half so you had two sauces in one pot. 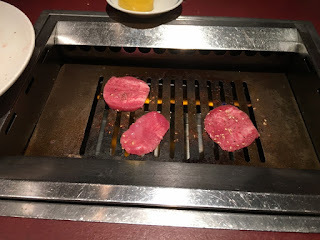 The pots were placed on a center burner (kind of like going to a fondue restaurant) and the sauces heated to boiling. Paper thin slices of meat are dipped into the hot pot until cooked to taste. Vegetables are also put in the pots and picked out as they finish cooking. Did I mention it's all cooked with chopsticks? The other unique feature of this restaurant was that it was all you could eat but you had to finish within 90 minutes. Many restaurants are set up for you to cook at the table. Sukiyaki - This was also done in the hot pots but the sauce is unique. It's soy, dashi (a flaked fish spice), sugar and sake. When you cook your meat or vegetable in the sauce you dip it in a beaten raw egg before eating it. The egg cooks around the hot meat and gives it a nice smooth flavor. Bento box - these we had when we visited the onsen. 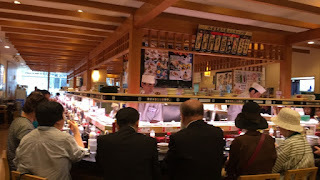 A bento box is like a tray with dividers and into each cubicle is something different. Always one with rice and then the others are filled with vegetables, fancy bean dumplings, thin sliced pickled lotus, and all sorts of delicacies. Some recognizable, some not. Sushi - this is usually thought of as a roll of rice with a chunk of fish and vegetables in the center all held together with a skin of seaweed. It's not always the case. Sometimes the fish can be resting on top of an oblong cube of rice but it always has some rice with it as opposed to sashimi which is just slices of raw fish. We had some tuna at the sushi restaurant that was so tender it was like biting through butter. I don't like all the raw fish offerings but several do appeal to me. The sushi restaurant we were in had a conveyor belt that took the offerings past your table and you chose what you wanted. They charged by the plate, from $1 for the white plate to $5 for the brown checkered plate. At the end all the empty plates are added up for your bill. No need to tell you what the Big Mac is but it does seem to have some popularity in Japan as does Starbucks.